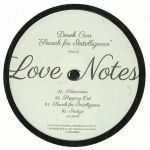 Review: Long serving Irish producer Derek Carr continues to enjoy a resurgent career following his appearances on For Those That Knoe, now stepping up to Love Notes for some of his most effervescent house jams to date. "Sidewinder" is a sprightly, Detroit indebted house workout pitched at peak time, while "Stepping Out" trips into classically informed techno for the back room crowd. "Search For Intelligence" is a great example of how to execute sweet natured electro, and "Indigo" ditches the kicks to twirl into more of that Motor City flavoured machine soul magic for the mind. Review: Love Notes turns its affections towards the Windy City with this exemplary 12" from Chicago producer Shmoo, who is no slouch in the energy department when rolling out the pumped up deep house delights of "Sidehacker". "Intellect's Intuitive Waste" is no slouch either, taking a brighter sunshine approach compared to "Sidehacker"s nocturnal veneer, and "Limited Trance" keeps the jack up while letting the additional tones and textures take things deeper. Garrett David gets busy with "Intellect's Intuitive Waste", creating a crafty remix steeped in intriguing percussion without losing that housey focus that defines the Love Notes approach. Review: Nick Anthony Simoncino is the perfect choice to add to the ever-expanding Love Notes narrative. His classically rooted, passionate approach to hardware house music chimes with previous 'Noters like Octo Octa and Casey Tucker, and the quality is as high on this 12" as one of his many appearances on Creme Organization or Vibraphone, to name but a few. "Perugia 1989" is quintessential Simoncino - simple in its construction but beautifully engineered with all emphasis on an undulating bassline. "Bella Ciao" is a more tense cut that uses some nervy synth phrases to eke out a trance-indebted mood, and then "My Brother, Dani" maintains the theme with a dramatic use of space and jittery percussion. Review: Love Notes strides into 2019 with a return visit by tape_hiss, last spotted on the label with the on-point Jacob's Ladder 12" in 2017. This time around the Brooklyn-based artist is unfurling twinkling, star-gazing, techno-tinted house to spellbind all manner of dancefloors. "Ephemeral Beauty" is positively sumptuous with its many layers of melodic interplay, giving remixer Joey Anderson more than enough material to work with. Anderson's version plays to his strengths as a weaver of understated, mechanical but soulful techno, setting the scene perfectly for B side tracks "Mono No Aware" and "Down So Long" to explore further avenues of deep, emotive machine music. Review: Casey Tucker is on a roll at the moment, and his infectious brand of uplifting, full-fat machine soul seems to have struck a chord in many places (not least via his reissues on For Those That Knoe). 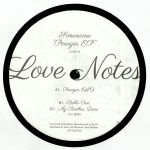 After appearing on Love Notes back in 2015, Tucker's back on the label with another salvo of colourful, charming and utterly magnificent house jams shot through with the inventive programming of techno. "Alternative Faction" is many things - a bubbly acid track, a swooning deep house cut and a sassy broken beat affair - and yet feels utterly smooth in its execution. "That Time Of Year" has plenty of Motor City soul feeding into its composition, not least in the gorgeous synth strings, and "New Mission" gets busy in the swing with all kinds of bouncing melodies and rhythms. 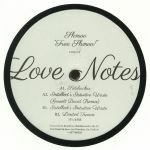 Review: The first place the world heard the lead track from this new Love Notes from Brooklyn release, "Where Pathways Meet", was on Deep House legend Mike Huckaby's My Life with the Wave show volume 2. Pascal Viscardi was one of many great artists to take Huckaby's warm tones and turn them into a work of art. "Pathways..." wriggles with deep funk and soul, and is paired with 3 other likeminded tracks for this very well-rounded EP. "Oshakusan" is the dancefloor track, juxtaposing warm chords and an insistent sax sample over the a tough bassline and rhythm combination that's aimed staight at the floor. "Free at Dawn" is the fathoms deep effort, going miles below the surface in a emotional expression of soul, and "And I Showed the Clouds (How to Cover Up a Clear Blue Sky)" provides a perfect outtro, and end to the statement made, making this EP feel truly complete.